Small Kitchen College » Healthy Homemade: Quizza! First, preheat your oven to 400°F and grease a thin baking sheet. Add the quinoa, beaten egg and all the flour into one big bowl. Give it a good mix. I find that using your hands work best in order to make sure the flour has fully incorporated into the mixture. Next have your pan on medium heat and coat it with some olive oil, you really need quite a bit of oil in order for this to work. Put a small scoop of your quinoa mixture into the pan and pat it down with a spoon, you want to form a nice round circle, sort of like a pizza base. Fry both sides until they are crispy brown, turning down the heat to low if your base starts to burn. Be careful when flipping though, this base breaks easily! Slide the base onto your baking sheet and spread your pizza sauce onto your base. Where I come from, some folks like to use a thousand-island based sauce. I haven’t personally tried this, but I’ve heard it’s equally as delicious and adds a strange creaminess to the pizza as a whole. Give a generous sprinkle of your cheese (or a thunderstorm of cheese sprinkling if you’re like me) and then place your other pizza toppings on top, as you would normally when assembling a pizza. Repeat with the remaining quinoa mixture until you’ve used it all. Bake in the oven for 8 minutes or until the cheese melts. 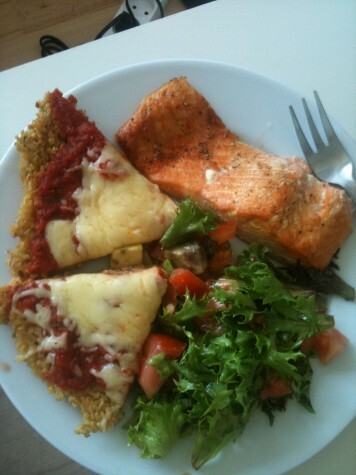 To serve, cut into slices and let the gooey melted cheese mix in with your crunch quinoa. Smile and relish the fact that you’re probably eating the healthiest pizza in the world. Stephanie is a recent adoptee of the pescetarian slow-carb diet. She likes to pretend to be Danish and eats lots of Danish Dream Cake. In her spare time, Stephanie likes shopping for her ever-expanding mustard collection. how a user can understand it. So that’s why this post is amazing. Thanks! Hello to every body, it’s my first go to see of this webpage; this website carries remarkable and truly excellent data in favor of readers. I as well am an aspiring blog blogger but I’m still new to the whole thing. Do you have any suggestions for novice blog writers? I’d genuinely appreciate it.